An old-fashioned apple orchard and farm with U-Pick apple varieties, a farm store, and a cider mill. 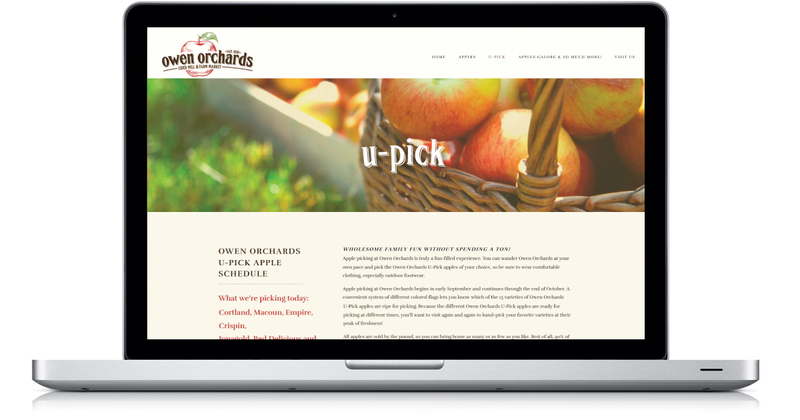 Owen Orchards entrusted Crème della Crème Copywriting & Communication with creating a user-friendly website that conveys the comfortable, wholesome goodness that can be experienced at their U-Pick apple orchard and farm market. Owen Orchards’ first-ever website is live and delighting long-time customers and new friends alike. The easily updateable site features current information about what’s ready for picking, as well as what’s going on at the orchard.